The DCEP is being developed in partnership with Lewis and Clark Community College, and with the support of a $35,952 National Endowment for the Humanities (NEH) Humanities Connections Grant. “Our most effective educational practices such as project-based learning and projects involving aspects of community engagement are incredibly important, because they have continuously proven to directly increase student retention and success,” said DCEP Project Director Jessica DeSpain, associate professor of English. With full program implementation slated for fall 2021, a collaborative planning committee’s work is well underway to see this educational pathway come to fruition. 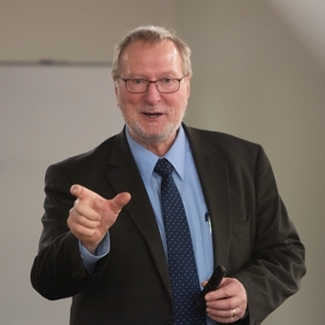 On Thursday, March 21, SIUE hosted James Liszka, PhD, director for the Center for Interdisciplinary and Area Studies, senior scholar with the Center for Ethics in Public Life, and professor of philosophy at the State University of New York Plattsburgh. He shared with SIUE faculty his experiences as part of a similarly-designed program: The Common Problem Project. The DCEP is designed to support underserved students by providing them with access to the high impact practices typical of an honors program. It plans to provide up to $4,000 of funding per year per admitted student. In summer 2019, the project team will host a week-long series of training events for interested faculty. In fall 2020, a pilot version of the DCEP will be launched. “I’m excited about this program, because it will help SIUE make a valuable, lasting impact on the surrounding region and emphasize the importance of the University for our community,” DeSpain concluded. Photos: On Thursday, March 21, SIUE hosted James Liszka, PhD, who shared his experiences with The Common Problem Project. 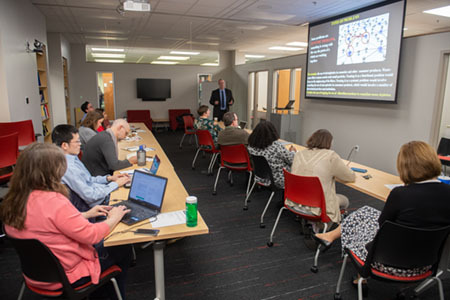 In preparation for SIUE’s Digital Community Engagement Pathway, SIUE faculty attended a workshop hosted by James Liszka, PhD.